QuaD-Rx TM : a new quad-constellation GNSS receiver IP-core module available in September ! Gnss IP.tech is pleased to announce the arrival of its new IP module QuaD-Rx TM. QuaD-Rx TM is a L1/E1/G1/B1 GPS, GALILEO, GLONASS and BEIDOU quad-constellation GNSS Receiver IP module designed to operate on current low-cost and low-consumption embedded platforms based on multi-core ARM processors and small FGPA/SoC devices. QuaD-Rx TM is the combination of about forty unitary IP-core modules developed by Gnss IP.tech, including advanced functionalities such as anti-spoofing and Assisted-GNSS. Currently under qualification process, QuaD-Rx MD will be available by September 2018 as evaluation or development kits for Broadcom B2837 (Raspberry PI 3 B et B+) or Xilinx Zynq 7Z010 (Trenz Electronic TE0726-03M) embedded platforms, or PC. 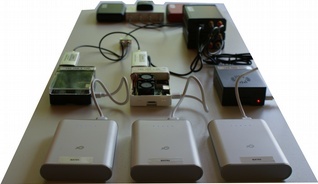 The evaluation kit consists in a utilization license of the IP-core to be used as a « black box » standard GNSS receiver, while the development kit allows more advanced use as it includes the unitary IP-core modules library and the compilation chain allowing to build custom architectures and to output lots of the receiver internal observables. In addition to the kits, data and innovative evaluation tools will be available in order to aid for the configuration and to permit suitable and strong evaluations of the IP-core.